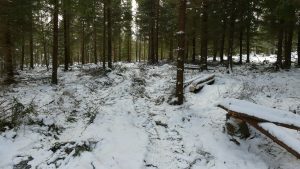 Many of the articles here at Forestry.com are about professional forest machinery with the latest technology. 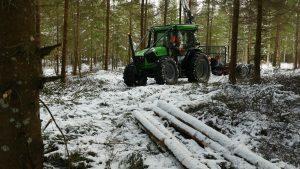 Among the Scandinavian forest owners, however, by far the most common forestry “machine” is a regular farm tractor with various types of equipment. 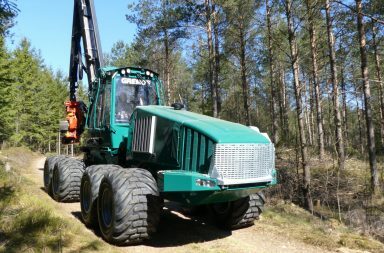 So forestry.com too a look at a Deutz-Fahr 5090G, customized for forest work. In Sweden, Finland and Norway combined farming and forestry is quite common. Most farmers also own forests. In Sweden, private forest owners (often referred to as ”family forest owners” in the Nordic countries) own more than half of the forest areas and their average size of the forest land is 50 hectare. Even though larger felling projects are contracted out, the smaller land owners still do a part of the work themselves. For this they use their tractor. 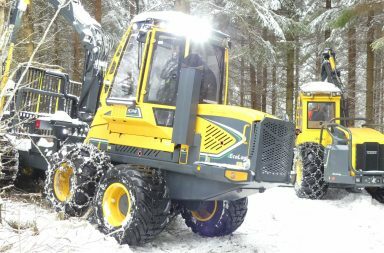 Valtra, John Deere and Massey Fergusson are the most popular brands on the Nordic tractor market though there are others who deliver special setups for forestry. Deutz-Fahr is one of these and they’re sold in Sweden by the dealer Söderberg & Haak. Here at forestry.com you can also find an article about a real small tractor concept, The Branson compact tractor with forest trailer. But this tractor size is rather rare among Scandinavian forest owners. 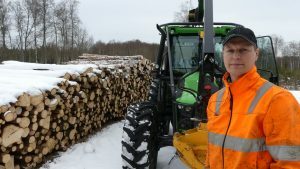 Forest owner Lars Björk, who lives outside of Älmhult in southern Sweden is a new Deutz-Fahr owner. He owns a forest of 40 hectare together with his wife and around Christmas of 2016 they received their new forest-adapted Deutz-Fahr 5090G. Forestry.com met Lars in their forest last winter to hear about his experiences and thoughts about his choice of tractor. The film camera was with us and there’s a video to see here below. After the storm Per ten years ago a Vimek 606 was bought for the wood transport. It was of great use and ran between 250-300 hours a year, until last year when it was time to change it for a new machine. It was getting old and lacked the capacity of the hydraulics for a planned project. The first thought was to get a better, used Vimek with a year or so behind it but such a machine seemed impossible to find. 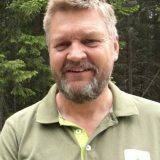 Instead Lars spent hours on Skogsforum.se (the Scandinavian sister site of Forestry.com) and read about various experiences and opinions of all kinds of tractors and machine concepts. – It was very valuable to go through and helped us make a decision on what we really wanted, says Lars. Lars’ conclusion was a relative small and not too heavy four wheel drive tractor, with a decently sized crane mounted directly onto the tractor and a suitable trailer. At the beginning he checked out a wide variety of brands but ended up with three alternatives: an 85 hp Kubota tractor, Valtra A83 and Deutz 5090G. The winner was the Deutz, in part because Lars found that the local Deutz dealer was the best at taking Lars’ clear wishes into account. The others were more focused on selling their own concepts while Lars was looking for a more tailored solution. The old Vimek was sold at a surprisingly good second hand value and the new tractor was ordered. The alternative with tractor, crane, wagon and forest adaption turned out to be on the same price level as if he’d bought a new Vimek 606, according to Lars. With that in mind he valued the flexibility of the tractor and the width of usage higher even though he would have appreciated the smaller size of the Vimek. The Deutz-Fahr 5090G with tractor mounted crane Mowi P25 and a Mowi trailer is a versatile machine for early thinning. Lars wanted the crane mounted onto the tractor and thus it passed through the workshop of Ölmstad Smide, a Swedish company specialized in adapting farm tractors for forestry use, before it was delivered to him. 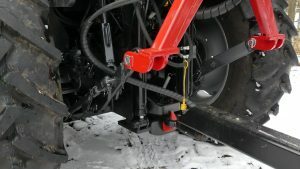 In an article at Skogsforum (only in Swedish) you’ll find actual images of Lars’ Deutz-tractor during the working process of mounting the crane. Besides the crane the tractor received a complete package of protective plates and structures. A wedge adapter was added to the rear window to give space to levers and to work with the crane, and the driver’s cabin was rebuilt for ease of use and extra space. The reason to why Lars wanted the crane mounted on the tractor itself was that he wanted to use it for other purposes than just to transport timber. For example feeding the firewood processor or lifting other pallets. He also wanted to attach and detach levers and hydraulics as little as possible and be ready to quickly use the crane. Thinning with forest adapted farm tractor Deutz-Fahr 5090G and Mowi crane and trailer gives a good result with small strip roads. Low impact logging! When I spoke with Lars the first time he wanted a few weeks to prepare before I could come and film. – At the start all the levers went “the wrong way” compared to what I was used to with the Vimek, says Lars with a smile. But now I’m getting the hang of it and working with the crane is smoother. So far Lars is completely satisfied with his setup and there will surely be many hours in the forest in the future. Forestry.com thanks him for the showing and visit! 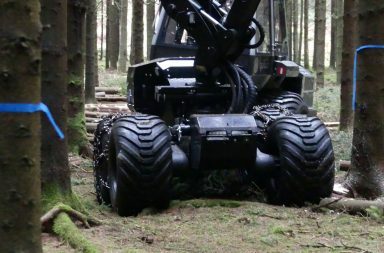 The forest customized Deutz-Fahr 5090G has a special hitch/hook for better ground clearance. Branson compact tractor – a forestry alternative?